2010 was declared ‘The year of International biodiversity’, and a year in which Stockholm was ‘EU’s first Green Capital’. In the light of these 2 events, ‘Foodprints’ explores how the discipline of biomimicry can promote urban food resilience and biodiversity in urbanscapes. There is an inherent relationship between the city and how food arrives on our plates. Here, we have created a toolkit to promote discourse, around ‘resilient’ cities, that mimic nature’s ecosystems, where all the elements are interactive, abundant in feed-back loops, conducive to life, and always reach the best use of resources. 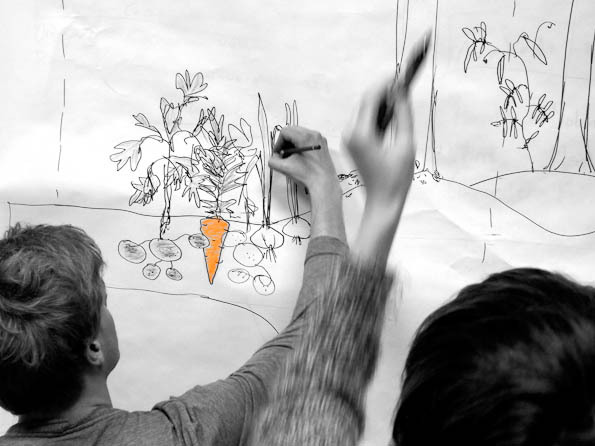 Our goal is to bring forward a resilient food culture through creation of this food toolkit which will be applied to the urban eco-city Norra Djurgården in Stockholm. The tool is of course further applicable to other urban schemes as well. During our design process, we have been threading together both scientific, artistic, futuristic, and culinary perspectives to examine our urban ecology and the way we feed ourselves. ‘Foodprints’ has been molded in a very creative process; science, art and biology, together with the built environment, creating a multi-disciplinary cocktail of collaborations. In the next phase, food becomes our communication medium, and we present our explorations in a ‘måltid’ (meal) designed around the senses experienced through 5 future food system scenarios. (see reverse) We stage a food performance with a intentional script. We hope that ‘reaction to the måltid’ can inspire invited guests involved in the Norra Djurgården development plans, to implement food system resilience into their urban planning policy process. Each typology is indicated separately on a ruler, presenting a holistic systems thinking approach to the complex discourse around food in the built environment. The toolkit can aid a number of diverse stakeholders sitting at a table not to lose sight of any angles. There is a morsel for everyone to join in! This project is kindly made possible through Innovativ Kultur, City of Stockholm. Funding was received from a bio-inspired call from the Innovativ Kultur department in the Stockholm Commune.